Go back to a place you love, everyday. Make it so comfortable that you feel relaxed! One important aspect of the perfect home that greatly embodies who you are is your outdoor space. The entrance to your villa begins from your garden! Your personality and lifestyle reflects from your garden and entrance. Feng Shui says that “You create the environment and the environment will create you”! Create a harmonious landscape so that it makes you feel peaceful, relaxed and cheers you up. Fill in your name & email ID in the box on the right to have Sejal, landscape designer dubai, call you! Lighting needs to be effective in enhancing features, creating moods by its different beams, subdued at certain places, focused at some places and indirect lighting in some area. It is the outdoor lighting that emphasizes the theme and accentuates the features of the landscape. A garden without proper lighting will fail to produce the ambiance you need.A landscape that is well lit creates beauty, and a feeling of safety. It is also important to note that varying the lighting techniques used will give the landscape a fresh and complete look. Another significant element is the lines of the landscape. You may not notice these lines but these subtle cues speak volumes to the subconscious mind. Horizontal and vertical lines serve different uses. Vertical lines, for example, make your space seem longer and slimmer than it really is. Tall trees and the like can be used to create these vertical lines. Horizontal lines on the other hand, make the space feel bigger than it actually is by pulling one’s vision along the ground. Walkways, fences and hedges create horizontal lines. Straight lines give a feeling of being formal and curved lines, a touch of informality. Curved lines are considered very aesthetic when presented correctly but they need more expertise, are more expensive and take up more space. There needs to be a sense of balance between the different kinds of lines and curves. Outdoor structures like swimming pools, pergolas, decks, gazebos, grills, outhouses and gardens should be planned according to your lifestyle and theme. These structures should be maximized to create harmony with the outdoor space. In deciding the sort of materials to be used for the landscape’s flooring, you should consider the aesthetics and your lifestyle. Inactive lifestyles more or less go with everything and you only need to choose the right materials that coincide and accentuate the design. Color theme, height, fragrance, suitability to the environment and temperature, seasonal or growing throughout the year may be some criteria to consider before planting. The plants’ colors play a significant role in the overall color of the landscape. One should choose the types of colors that will make the landscape more soothing and those that will help unify the color theme of the design. White, for example, attracts the eye and should be used as little as possible, though it would make for an extremely effective focal point. Plant heights affect the lines and vertical boundaries of the landscape. One should consider the current height and overall height that these plants will have. Well-clipped hedges and topiaries create a formal look. Trees, on the other hand, create a natural scene and give the landscape an informal look. Most of the time, the sound element is overlooked and neglected. But it is a very powerful element in landscape design. A garden should have a natural and soothing sound. The type that calms the nerves and relaxes the senses. Waterfalls and other water elements should be placed with great care to create the desired effect. Strategically placed rocks and plants are good ways to control the sound from water elements. The landscape designer should keep these in mind at the time of conception of the design. A theme that works best with one’s lifestyle and personality should be chosen. With these tips in mind, when going over the design with an architect, you will have the advantage of knowing what works and what won’t. This will give you better control over the final design. And you will be able to create the kind of backyard that you have always wanted. 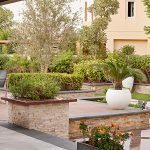 Other visitors to this landscape designer dubai page look forward to seeing your comments in the space below. If you like what you have seen or read on this page share it with your friends by clicking on one of the social media buttons below.